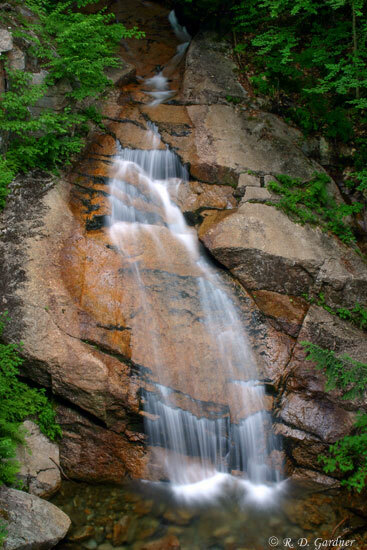 This waterfall can be found in the Flume Gorge of Franconia Notch State Park. The state park is located in the White Mountain National Forest and runs for about eight miles along I-93 from Flume Gorge at the southern end to Echo Lake on the northern end. This is not a free state park. Park hours and rates can be found here. 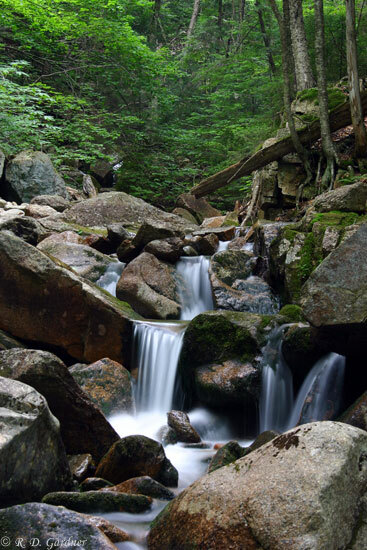 There are several other good waterfalls within Franconia Notch State Park, including Avalanche Falls and The Pool (within the Flume Gorge area), The Basin, Cascade Brook Falls, Cloudland Falls, and Kinsman Falls, to name a few. This cascade is one of those "freebies" that shouldn't be missed. It's smack dab in between two great areas - the Flume Gorge and The Pool - so you should walk by and stop to soak in the view. Flume Gorge is well marked. Your best bet is to visit the Franconia Notch State Park website for directions. Liberty Gorge Cascade is on a hiking loop within the park that includes Flume Gorge, the cascade, and The Pool. The trail begins behind the visitor's center. The less adventurous can hitch a ride to the bottom of Flume Gorge on one of the park's passenger buses. Starting at the visitor's center, the round trip hike to the falls, Liberty Gorge Cascade, and The Pool is just over 2 miles. For just Liberty Gorge, the hike is 1.4 miles one way if you go through Flume Gorge, closer to 0.6 miles if you go to The Pool first. Taking the shuttle bus will cut your distance (through Flume Gorge) by 0.5 miles. You will cross the creek at the top of the cascade before reaching the overlook. The view up the creek is quite nice, reminiscent of the Smokey Mountains, so I've included that photo on the left as well. For more details on this popular loop hike, check out this great description on GORP. Without a tripod you will be out of luck here, especially in mid-summer or Fall when the volume is down. This cascade does not photograph well at normal shutter speeds. You will definitely need a polarizer to reduce glare on the rocks and foliage. The granite face here catches a considerable amount of glare and reflection from the sun. There is really only one composition as the terrain is too steep for exploring and every other view but the overlook is limited by foliage.